At the end of January just after Saudi King Abdullah died and power transitioned to King Salman, oil prices saw a slight uptick and closed just below $60 a barrel and natural gas closed at about $3 BTU. As noted in my previous article, Saudi Arabia and the United States are using this price war for their own reasons and are somewhat in conflict with each other. 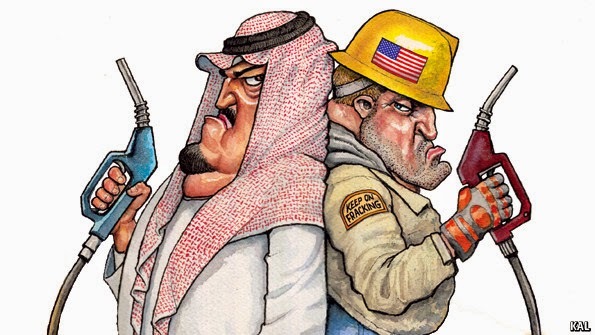 Saudi Arabia is trying to take out its competitors, both within OPEC and the U.S. shale industry. The United States is attempting to hurt the Russian economy and Vladimir Putin. Fortunately and unfortunately (depending on your perspective), both nations are achieving their goals in this price war. Smaller U.S. energy companies did not hedge properly for these low prices and could face the consequences (even bankruptcy) before the summer. Permit requests in the Marcellus Shale are beginning to take a nosedive and North Dakota is not predicting billions in lost potential revenue for years to come. Larger U.S. energy companies will do just fine and either hedged properly or can absorb short term low levels. Newly elected Democrat Governor of Pennsylvania, Tom Wolf, recently signed an executive order banning new fracking operations within the commonwealth. New York has a similar ban. Voters in Denton, Texas also banned fracking in a recent referendum. Lawsuits are guaranteed to occur in at least the Pennsylvania and Texas cases. Many regions within the U.S. fracking industry can barely break even at $60 a barrel of oil, however, the industry would be optimal in the $75-$90 range, which is still fairly below the break even budgets for many OPEC nations and Russia which is over $100 a barrel. The "biggest losers" in the price war will be African OPEC countries, Venezuela, and Russia, with the potential of massive political instability as a ripple effect. At a World Affairs Council of San Antonio meeting, Ambassador Roger Noriega predicted President Nicolas Maduro will not last beyond this spring as grocery stores are empty and the people are ready to riot in the streets. Ambassador Noriega does not think the police or military will intervene compared to how they acted and arrested/intimidated hundreds, if not thousands of people following the election of Maduro. Venezuela cannot afford these low fuel prices and Maduro's global trip begging for money from countries such as China was a failure. The Arab Spring countries could also face another wave of protests as these nations need oil to be well beyond $100 a barrel to even somewhat function/recover from the former regime collapses. Another nation that needs higher energy prices is Nigeria as it struggles to combat Boko Haram (the ISIS of Africa) and is due for an election in February for President where the Muslim candidate, Muhammadu Buhari, will most likely defeat the incumbent Christian President Goodluck Jonathan. These price wars will cause regimes to collapse or institute massive policy changes before the fall and most likely cause a political vacuum potentially spanning across at least three continents. Experts in the energy sector who have consulted with me over the past few months predict prices could go as low as $35 a barrel for oil in the summer months (a time when reserves are at their highest because of multiple factors) and still reach around $90 a barrel by December 2015. The problem is even if the $90 is reached in eleven months, it will be too late for many regimes. Saudi Arabia will eliminate some of its OPEC rivals and the U.S. industry will take a black-eye. The three unknown factors will be just how well the U.S. fairs during this time frame (along with Canada) and whether it can collapse OPEC and Saudi Arabia once and for all. The second factor will be how Russia survives a massive recession (and most likely a depression) because of energy. Putin is still very popular in Russia, yet that could begin to change this year. The last factor and most frightening is what will exactly happen to Venezuela and the African OPEC countries. A second "Arab Spring" may occur this year, giving another chance for radical groups to take even more land.